Tessie O’Shea, Shirley Bassey, Charlotte Church, Cerys Matthews: Cardiff has been the birthplace of so many notable female singers. But there is another we can add to that list – arguably one of the greatest white soul singers of the sixties. Yet hardly anyone has heard of her. Gill “Tawny” Reed was born in 1946 and brought up in Diamond Street, Adamsdown. After building a reputation as a compelling live performer she was signed by Pye in 1965 – star songwriter-producer Tony Hatch travelling to Cardiff for the honour. Her first UK single, a cover of Needle in a Haystack, was picked up by the US label Red Bird – home of the Shangri-Las – making Gill the only British artist ever to feature in their legendary catalogue. However, poorly managed by Tom Jones’ original managers, Myron and Byron, her career suffered from a woeful lack of support, her two Pye singles failed to chart, and she was unceremoniously dumped in 1966. Nevertheless, Gill was not forgotten by her fellow musicians within the vibrant Cardiff music scene of the Sixties. In 1969 one of Cardiff’s most famous sons, Dave Edmunds, recorded a song with her, Maybe, which showcased her astonishing vocals, full of amazing power and understated yet heart-wrenching emotion. That single was not released till 1977, when it was picked up by another legendary label, Stiff Records, flag-bearers for the punk movement. Besides its vocal virtuosity, the single was notable for two things: the urban myth that Dave Edmunds was actually the vocalist (he recorded lead vocal in a second version), and the fact that the record cover featured the words “Jill, if you’re out there, write to us for your royalties” – testament to the fact that Gill Reed had by then given up the music scene and lost contact with her former collaborators. There was another sad twist to Gill’s story. After marrying and bearing two children, she was diagnosed with stomach cancer and, having chosen to live her last months by the sea in Porthcawl, died in 1985 at just 39. 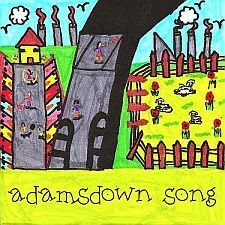 I first became aware of Gill while researching the history of Adamsdown for a community music project, Adamsdown Song. I wrote a short piece about her on the project’s website and was surprised to get a number of responses from people who knew her. These included Blue Weaver, founder member of Amen Corner and later keyboard player for the Strawbs, Mott the Hoople and the Bee Gees. In 1965 Blue had answered an ad in Melody Maker asking for musicians for a backing band, and had travelled from Cardiff to London to audition, only to discover that the singer he would be backing was Cardiff’s own Gill ‘Tawny’ Reed! Myron and Byron had placed the ad, but once the Heatwave were formed, Gill was left to her own devices and played precious few gigs over the next six months. It was a far from glamorous existence, with Blue and Gill sharing a flat in Shepherds Bush (and later in Putney) while washing dishes in the nearby pubs. Survival depended on picking the lock on the electric meter and ‘borrowing’ food (which they sincerely intended to repay) left in the early morning outside the local shops. It must have been a frustrating time for Gill. As a working class girl from Cardiff, she was a complete outsider to the London music scene, without contacts or support, watching lesser talents making it while she pulled pints. Tom Jones had ditched Myron and Byron quickly and acrimoniously once he was convinced they were more concerned with their own songwriting ambitions than his singing career, but he was better established than Gill and had alternative management waiting. In some ways Gill was tantalisingly close to where it was at in Sixties London. The Heatwave’s guitarist, Steve Hammond (later of the Chris Barber band) shared a house in Fulham with one of the key figures of the then music scene, Zoot Money. Also resident in the house was 16-year-old guitarist Andy Summers, later of the Police. Gill would have often visited 11, Gunterstone Rd; just as she gave up the ghost and returned to Cardiff it became the first stopping-off point for a visiting guitarist from the States – Jimi Hendrix. Eventually Blue tired of their fruitless life in London and returned to Cardiff, where Amen Corner soon formed, played seven gigs a week, and achieved the chart success that had eluded Gill. It has been difficult to trace exactly what happened to Gill after Blue left, but she seems to have spent some time touring in Europe, primarily Germany. By 1968, however, her ambitions had clearly faded. She married a driver from Derby and started a family in the house next to her mother’s on Diamond Street. In time both households moved to a larger house on Windsor Terrace, Penarth, until Gill’s tragic illness and final move to Porthcawl. Besides the two Pye singles and her sole single on Stiff, there remain just two videos of Gill, miming to Needle In a Haystack and I’ve Got A Feeling for a German TV programme. Despite the low production values and the presence of a less than inspiring (and frankly creepy) audience, Gill’s vibrant personality still shines through. It’s easy to imagine the high-spirited young girl who had once taken a duck for a walk down Clifton Street, who even when married with kids would stun the crowds in Cardiff’s dockland clubs with her wild dancing. Tawny Reed could have been a star. At a time when British artists were rightly derided for their lame covers of Motown originals, her versions stood comparison with the best of US soul. Sadly, however, talent does not guarantee success in the music business. And even though her singles now sell for £180 and compliments on her fabulous voice can be found on websites from the US to Sweden, she has received no recognition in her home city. So much of the old Cardiff has been swallowed up by the new, we are in danger of losing sight of some of the most important people, places and ways of life in our city’s history. Gill Reed stands for Adamsdown in a way that Shirley Bassey never really stood for its neighbouring district of Splott, so how about something to remember her by and inspire today’s residents?